Spent time on the boardwalk of Field 6 at Jones Beach yesterday. I was looking for some color and found it. Did you find some RED during your week? You did indeed find some color. Nice reds, and others, too! It looks so pretty where you are! Have a fabulous day. Ah, you make me want to go to the beach! Looks like a good time to have fun! Lucky you! I love walking along the beach but the nearest is almost 600km from my place! Lots of colors and summer too. We are still writing spring. I'd love a day at the beach just now. Seek & ye shall find. . .and you did! Lots of red, for today. Lovely beach post! The boardwalk looks like a great place to walk, especially this time of year where it's not quite so hot. Great capture. Makes me want to go to the beach too. Love all the mini stories in this colourful photo! Good one! The beach is perfect in my estimation - I am not a sun worshiper, and with fewer people, the love of sea breezes is better. I's happily park my wheelchair at the railing of the boardwalk, breath in the briny atmosphere and really relak! I can't get the words of Under the boardwalk out of my mind now that I have seen your picture! Looks like holidays ! It's good that some people like red, me included, lol ! yes, you did find some color. the light is so bright and lovely. it looks like a fun spot to be. 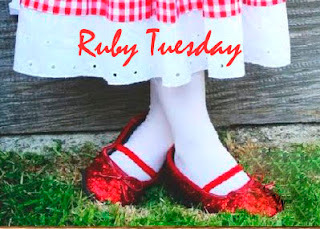 thanks for hosting Ruby Tuesday each week. looks like a good day out there when you took the photo. have a good week! Looks like a wonderful way to spend a spring day! You found lots of red! What is a week without red? This photo is just like out of a magazine! Perfection!!! Love it. Hope your Tuesday is treating you well!! It is extremely hot here. The beach front is very inviting! Nobody is commenting on our blog this week. We're counting on the Ruby Tuesday crowd! Your photo puts us in a cheery (and cherry) mood. walking is a great way to start the day right. Mommy Rubz, I just grabbed your CDOmommy blogger's badge. I am sorry I missed attending the meeting last monday, I was informed by grace F., but unfortunately I was not on line that day, and missed the message. I am your avid follower mommy rubz hehe. Hello, dropping by for RT :) Nice beach view there. Loved the sunny warm weather. Hope to see you in my RT post at my www.heartscontentofamama.com blog.